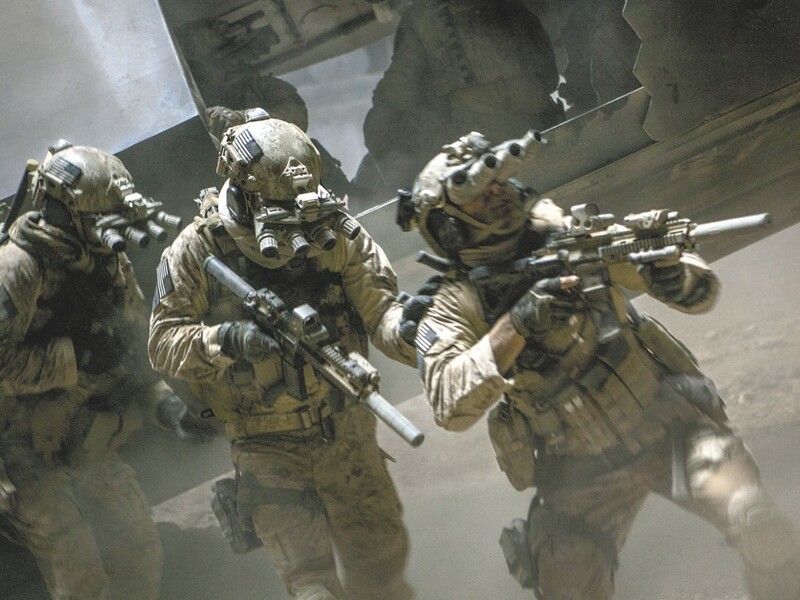 The raid scene of Zero Dark Thirty is high-action cinema, but hardly the most compelling aspect of the film. If you’ve seen the preview trailers for Zero Dark Thirty, which is military jargon for half-past midnight — the exact time Navy SEALs hit the ground at the Pakistani compound where they killed Osama bin Laden — you’ve probably got the wrong idea of what the film is really about. Oh, it climaxes with that late-night raid, shot in real time and featuring some incredibly tense moviemaking. But that’s only the last half hour of a two-and-a-half-hour film. This collaboration by director Kathryn Bigelow and writer Mark Boal, who also worked together on The Hurt Locker, is much more about the almost decade-long, frustration-filled series of counter-terrorist operations that led up to the raid. Actually those first two hours focus on the CIA operative known here as Maya (Jessica Chastain), who is, in reality, an amalgam of a few agents, but for dramatic reasons is presented as one person. At the film’s start, she’s on her first assignment, just settling down, still dressed in a tailored black suit, at a CIA black site in Pakistan, where suspected terrorists are routinely chained up, waterboarded, stuffed in small boxes — OK, tortured — in order to get information out of them. The sessions are run by another CIA man, Dan (Jason Clarke), who is cold, cruel and mostly calm, just there to do his job — get these people to talk, to give up details that might lead them to bin Laden. But far from the recent complaints of U.S. senators, from both sides of the aisle, who claim to have seen the film and are slamming it for its inaccuracies in portraying what went on at those black sites, the film neither promotes nor celebrates torture. It’s there, all right, and it’s tough to watch, and in a couple of cases (according to the film), it resulted in some solid leads. But it’s in the film because it did happen. The early torture scenes provide a jumping off point in telling Maya’s story. When she first sees what’s going on she’s appalled; she can’t even look. Later on, she’s one of the people doing the questioning (but not doling out any punishment). Still later, years later, she has transformed from a meek newcomer to a hardened operative — some call her the “agency expert” — on what sometimes seems like a one-woman campaign to hunt down and find and kill bin Laden. Chastain, who played a troubled Mossad agent in The Debt, turns in a magnificent performance as an agent who’s trained to be unemotional, and succeeds, except for the few times she’s alone. But this is not only about Maya. There are plenty of people around her, many of whom meet their demise during the search, much of which is shown in talky, behind-doors sessions, some of which happens out in the field. Years go by, with specific dates and locations flashing up on the screen, almost like chapter headings, that will alert students of history about what’s going to happen. Of course, everyone knows how it’s going to end, and when the familiar-looking compound is finally shown, the film’s slow pace and scenes of endless talking make way for some knuckle-biting action. The final section is presented in something close to documentary style. The sight from behind green night-vision goggles is creepy, the atmosphere is cramped, the absence of soundtrack music is unnerving. It’s easy to forget everything that led up to this point, except for the fact that you’ve witnessed an amazing arc in the character of Maya. But that might not even register in some viewers, as most will be going through feelings of excitement, exhilaration and exhaustion.